the former Yugoslav republic's 1991-95 independence war. market worth investing in," real estate agent Jasminka Biliskov told AFP. centrepiece of the country's lucrative tourism industry. Almost 80 percent of island buyers are foreigners, Biliskov said. Britons top the list, followed by Hungarians, Swedes, Norwegians and Germans. Biliskov's agency currently has seven islands on its books and recently sold Smokvica, near the central Adriatic town of Primosten. company which is planning to build a botanical garden there. It reportedly fetched 1.6 million euros (1.9 million dollars). which no title can be obtained. The state is also planning to reserve exclusive rights to buy islands within 90 days of their being offered for sale. conditioned, defined and controlled," Biliskov said. The law should enable construction of small, traditional Mediterranean-style stone houses, she said. But despite the legal complications, Croatian islands have the advantages of being relatively cheap, unspoilt and close to Europe. "The most important thing is that the landowners realize that they are in possession of the 'family jewels' of the Adriatic, a heritage of priceless value,"
Tourism Minister Bozidar Kalmeta said. He complained that the islands were being offered for a "trifle compared to world prices." 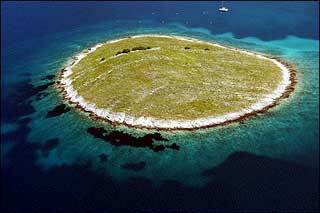 But Biliskov said Croatia's islands would not be bargains for long. "The prices of real estate in Croatia are booming now and show a tendency to continue like that," she said.